BBQ Jackfruit in place of pulled pork is nothing new. They actually sell canned jackfruit at Trader Joe’s next to their BBQ sauce. As someone who does not eat pork, I have been very interested in exploring jackfruit as a substitution. It wasn’t until recently when my husband I were exploring Brooklyn that I discovered Perelandra Natural Foods. Not only did this grocery store have an amazing selection of healthy foods, but also it has an incredible plant based kitchen. The have 14 vegan sandwiches to choose from, ranging from tu-NAH melts, roasted tofu reubens, and of course smoky pulled jackfruit. Let’s just say this grocery store alone is enough of a reason for me to move to the area. 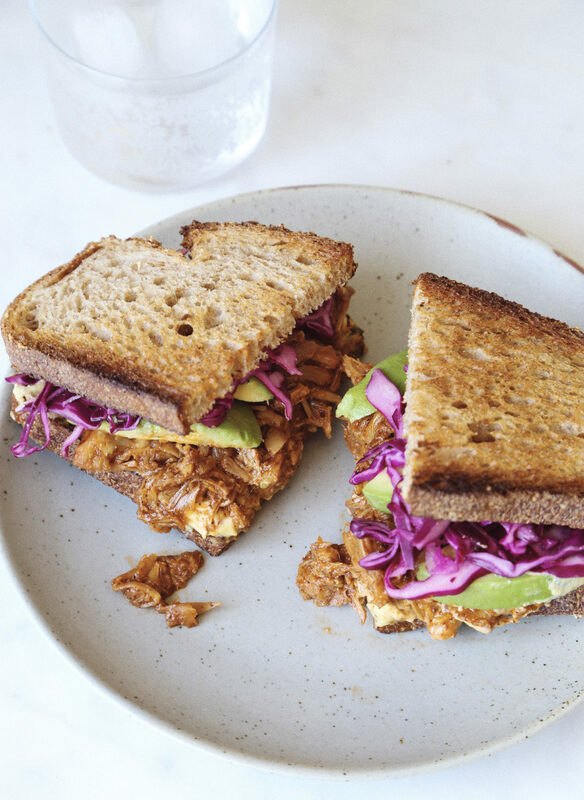 I enjoyed the smoky pulled jackfruit sandwich in pure bliss and knew it was time I created my own recipe to share with you guys. Young green jackfruit is a popular substitution for pulled pork because it has a very subtle flavour that isn’t sweet. Similar to tofu it absorbs the flavours it’s cooked in. Most importantly, it can be mashed up to resemble pulled pork. I purchase my canned jackfruit as Trader Joe’s but you should be able to find it at Asian grocery stores. Make sure you don’t buy ripe jackfruit in syrup. This jackfruit is delicious and tastes like Juicy Fruit Gum, but it is too sweet and will not be the right texture needed for this recipe. This is a great meal to make in advance and heat up before serving. The jackfruit should last in the fridge for a couple days. The combination of smoky jackfruit, crispy slaw, hot cheese sauce and luscious avocados is unreal. I’m planning on making it at the cottage this summer for my family. If they’re lucky! Using a mandoline or a sharp knife, thinly slice the cabbage. Place cabbage in a bowl and toss with vinegar, salt and pepper. Cover and place in fridge until ready to serve. Pour boiling water over cashews and allow to sit for 15 minutes. Drain and place in a blender with nutritional yeast and salt. Blend until smooth. Stir in enough hot sauce to your liking. Toss together the jackfruit and spices. Heat oil in a large skillet over medium heat. Add the jackfruit and stir fry for 2 minutes or until spices are fragrant. Add the BBQ sauce and 2 cups of water. Bring to a simmer, turn heat to low, and cover for 45 minutes, stirring occasionally. Simmer uncovered for an additional 10 minutes, or until sauce has thickened. Using a wooden spoon mash the jackfruit until it resembles pulled pork. Season to taste. To make the sandwich, spread cheese sauce on one side of the bread and top generously with the BBQ jackfruit, 1/2 of an avocado and slaw. Serve hot! This entry was posted in Main Dishes and tagged acv, apple cider vinegar, avocados, bbq, jackfruit, nutritional yeast, plant-based, summer, Vegan, vegan cheese. Bookmark the permalink.